Below is information and resources available to Seniors. To discuss any of this information in more detail, please contact University Realty at (949) 632-2526.
and have no monthly mortgage payments! The Reverse Mortgage Purchase Loan, for individuals 62 and older, requires No FICO score and limited income is okay, so it is very easy to qualify. Congress passed the HECM for Purchase Plan allowing Seniors to get a new home. Homeowners keep more of their money, and have no monthly mortgage payments. Seniors can sell their current home and only use a portion of the sale proceeds as a down-payment toward a “downsized” home, while keeping any extra proceeds available and earning interest. 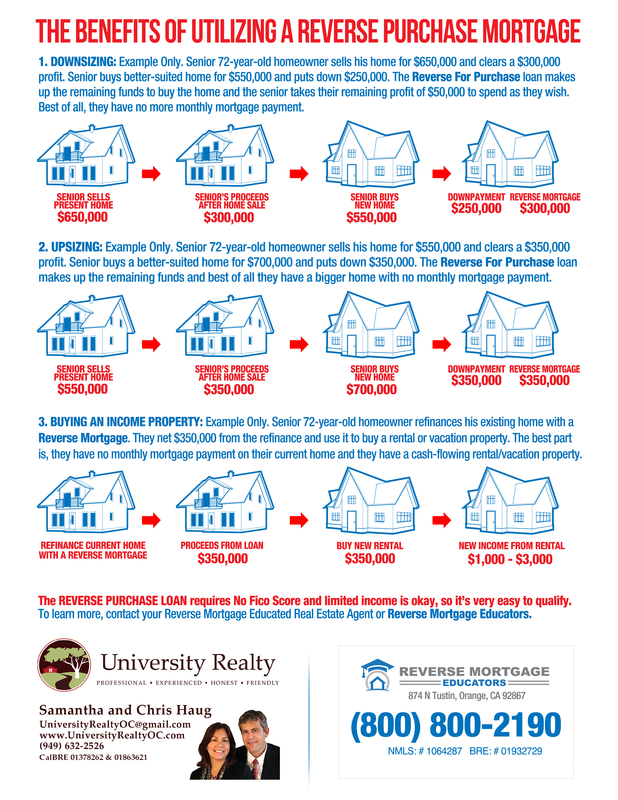 The Reverse Mortgage for Purchase picks up the difference and you’ll have no monthly mortgage payments ever! Considering down-sizing? Tired of being tied to a big home? Prefer a one story home? Want to learn more? Contact University Realty to schedule a no pressure, informational meeting. current tax base to their new home too! Did you know that if you are 55 and over, under certain conditions of Proposition 60 and 90, you may be able to transfer your existing primary residence’s factored base year value to a replacement home that is of lesser or equal value than your existing home? Basically, the current house that you are selling should be of equal or greater value than the new house that you are buying. Prop 60 and 90 provide property tax savings to California seniors who are 55 and older who are considering to move, downsize, sell their home and buy a new home while keeping their lower property tax base. There are 11 counties in California including Orange County who currently participate and provide this property tax savings to seniors. Did you know that the government approved reverse mortgage program has been around since 1988? Here is a little history about the reverse mortgage program. The first reverse mortgage loan was written by Nelson Haynes of Deering Savings & Loan (Portland, ME) in 1961 to Nellie Young, the widow of Haynes’ high school football coach. The reverse mortgage helped her to stay in her home despite the loss of her husband’s income. The program slowly began to grow in popularity during the 1970’s with private banks offering the reverse mortgage loan. While the program was helping many seniors it did not have the same types of protections of today’s reverse mortgage program. During this time the FHA insurance was not in place on the reverse mortgage loan. By the early 1980’s the U.S. Senate Special Committee on Aging reported that the program was in need of having a set of standards. The committee also concluded that there was a need for FHA insurance and uniform lending practices. By 1987 Congress passed the FHA insurance bill that would insure reverse mortgages. On February 5, 1988 President Ronald Reagan signed the FHA Reverse Mortgage bill into law. In 1989 the First FHA-insured HECM was given to Marjoire Mason. 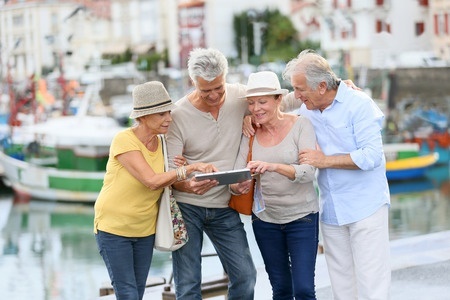 The reverse mortgage program has been helping seniors live a better life for over 25 years. Here are just a few of the benefits of the program.